Tens of thousands of Palestinians demonstrated in the Gaza Strip on Saturday, marking the one-year anniversary of the Great March of Return protest movement that has rocked the besieged enclave. Three Palestinians were killed by Israeli fire. However a repetition of previous protests, where as many as 60 people have been killed in one day, was averted. Two of those killed, Adham Amara, who was shot in the face, and Tamer Abu al-Kheir, who was shot in the chest, were 17. They are the 50th and 51st children to be killed by Israeli forces in Gaza since the Great March of Return began, Save the Children said. Now some 200 Palestinians have been killed overall as Israel has cracked down on protests that have become a weekly occurrence. Ahead of Saturday’s protest, Palestinian factions called for calm, and around 8,000 members of security were deployed along Gaza’s 65km frontier with Israel to stop protesters from reaching the boundary fence. The efforts appeared to be largely successful, with the assistance of an Egyptian delegation that has been brokering negotiations with Israel and the Strip’s rulers Hamas. Both the Egyptians and Hamas’ leader in Gaza, Yahya Sinwar, appeared near the frontier to urge restraint. Hamas hopes an agreement with Israel can help ease the blockade that is crippling the deprived coastal enclave. Khalil al-Hayya, a senior member of Hamas’ politburo, told MEE that the protests can help implement such an agreement. “Today I salute the people who participated in their thousands in this protest, despite the hunger,” he said on Saturday. Despite the protesters’ restraint, Israeli forces met the demonstrations with live fire, rubber bullets and teargas. Nizar Abu Amro, a paramedic with the Medical Relief Association NGO, told MEE that Israeli forces were using a new type of gas on the protesters. “They used nerve gas and another strange kind of teargas, which is yellow. We do not know anything about its contents, but it causes strange disorders,” he said. The gas was first seen two days ago in Jabalia in Gaza’s south, and Abu Amro said it is now being tested to determine what it is. Several Palestinians described Israeli forces firing on protesters despite being some distance from the frontier. 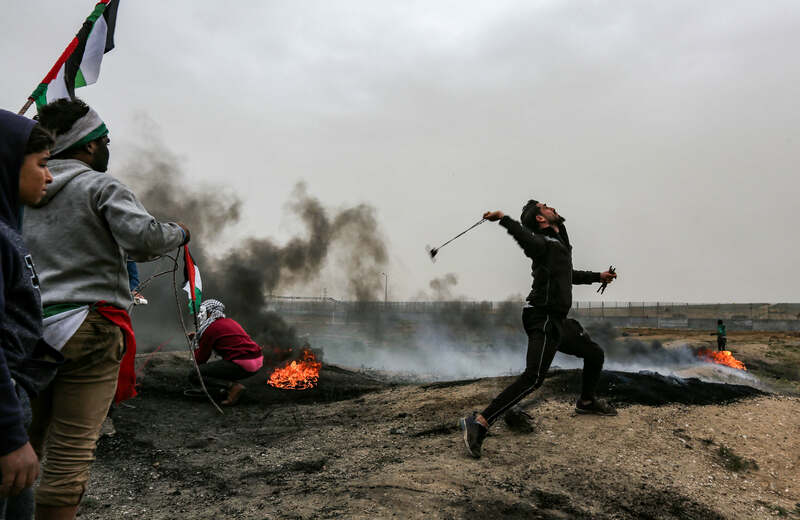 An MEE correspondent east of Gaza’s al-Burij refugee camp witnessed the military heavily firing teargas at Palestinians despite them being 300 metres away from the boundary fence. According to the Gaza health ministry, 244 Palestinians were wounded across the Strip, five of which were in critical condition. A paramedic was among those injured. A year ago the Great March of Return kicked off calling for Gaza’s 11-year siege to be lifted and for the right of return for Palestinians locked out of their ancestral homes now in Israel. Speaking to MEE as he toyed with empty teargas canisters, Hussein Swedan, 15, said he had every intention of returning to the central Israeli city of Ramla, where his family was expelled from in 1948. “I came here to tell the world and the Israeli occupation that I will never forget the land of my fathers and grandfathers. We have a home in Ramla and we will one day return to it,” he told MEE. In Malaka, east of Gaza City, Iktimaal Hamad told MEE that Palestinian women’s place at the forefront of the protests was crucial. “The Palestinian woman has brought forth something so precious and valuable for the sake of the Palestinian cause, and will always be on the frontlines confronting the challenges, confronting the plots that she is exposed to,” she told MEE. Nearby was Attallah al-Feeyomi, 19, who was shot in the leg in the same spot during an earlier protest, leading to amputation. 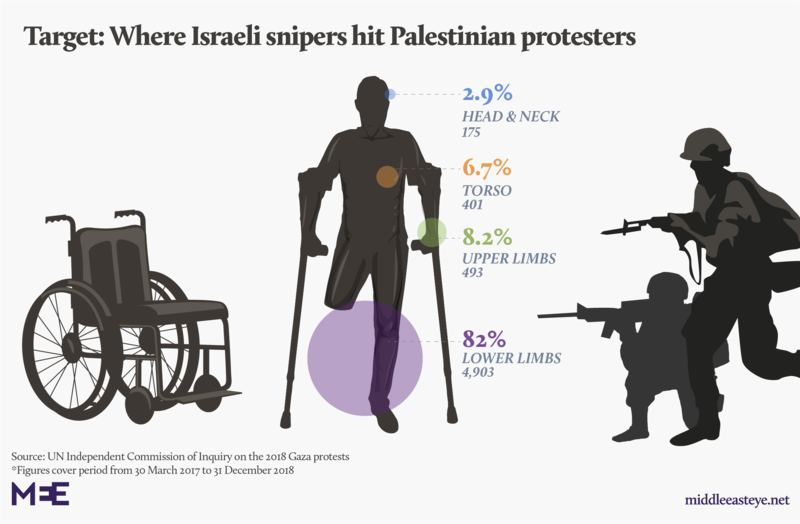 He is one of at least 136 Palestinians to have had a limb amputated after being shot while protesting this year, according to Gaza health ministry statistics. “We are here to break the siege on the Gaza Strip and call on the occupation to leave our lands,” he said. Saturday also saw the anniversary of Land Day, when in 1976 Israeli attempts to expropriate Arab land were met with widescale protests. Land Day has subsequently become a cause celebre for all Palestinians, hence the March of Return’s start date. Outside the illegal Israeli settlement of Beit El in the occupied West Bank, a demonstration turned violent, as Palestinians resisted the Israeli military presence by burning tyres and throwing rocks. Meanwhile, in Sakhnin, a town in Israel’s Galilee, 2,000 Palestinian citizens of Israel braved poor weather to march and protest. Palestinian citizens of Israel congregated in a Sakhnin hall to listen to speeches by politicians. “In Sakhnin, in Gaza and the West Bank, the Palestinian people have announced their attachment to its land, to its nation and its shared fate,” Jamal Zahalka, a Palestinian member of the Israeli parliament and head of the Balad party, told MEE. Mohammed Baraka, head of the Arab Follow-Up Committee, which represents Palestinian citizens of Israel, used his platform to decry the recent US recognition of Israeli rule over the Syrian Golan Heights. “It may take time but states of tyranny will fall and states of freedom will rise,” he told the crowd.